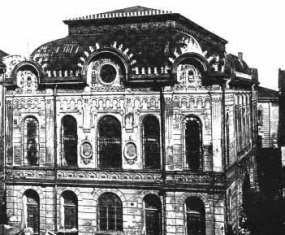 The Reform community of Przemysl dedicated the Tempel synagogue on Jagiellonska, on the river San, on September 18, 1890. It was a substantial brick building in the Romanesque revival derived style known as Rundbogenstil. It was designed by architect Stanisław Majerski (1872-1926,) a graduate of the Lwów Politechnical School. The Tempel had an organ and most of the service was in Polish. 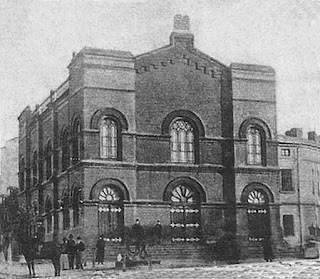 Construction of the religiously traditional Scheinbach Synagogue, also known as the New Synagogue, began in 1910 and completed in 1918. It was even larger and more elaborate than the Temple. The building survives; it has been renovated and is in use as a public library. While it is a handsome building today, the Communist-period renovations stripped so much of the exterior detail that it presents an appearance in marked contrast to the building we see in old photographs. The synagogue is a free-standing building in the heart of the city with the sidewalk and street tight against it on every side. Like the Tempel, it was designed by architect Stanisław Majerski, and, like the Tempel, it was built in the Rundbogenstil tradition. Unlike the Temple it was embellished with an eclectic array of elaborate rooftop crenellations and molded decoration. Period sources appear to have described the synagogue as “Mauretano-eclectist” in style. Mauritania, the Roman name of a Berber North African kingdom, was used as a synonym for Moorish in the period when the synagogue was built. Building synagogues in Moorish style was a statement of identity, a way of boasting that Jewish lineage could be traced back to ancient Israel. The only apparent Moorish element in the Przemysl synagogue is the roof line crenelation. The elaborate interior decoration with Biblical scenes and what appear to be palm trees in the old photo reflects an early twentieth-century fashion for decorating synagogues with Biblical scenes and Eretz Israel motifs. The fashion reflected increasing familiarity with and enthusiasm for the Land of Israel at a time of increasing enthusiasm for Zionism. 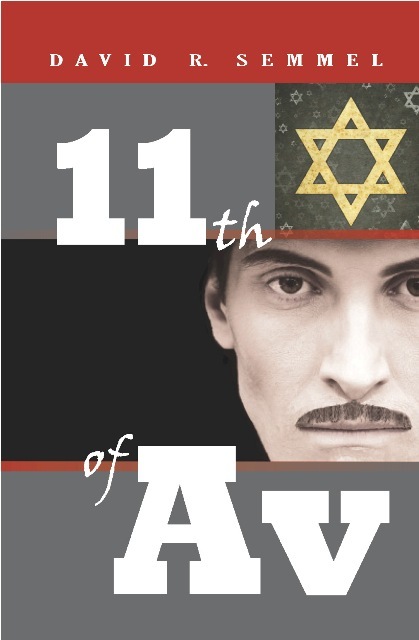 Photographs, posters, lithographs and other images of Eretz Israel hung on the walls of every synagogue in the Diaspora, whether the congregation was Zionist or anti-Zionist. The New Synagogue in Przemysl was fortunate in being wealthy enough to have such scenes painted on the walls and ceiling and to have a notable set of stained glass windows. The windows and paintings were by a Jewish Przemyśl artist named Adolf Bienenstock (1888-1937,) a graduate of the Krakow Fine Art Academy (like Przemysl, Krakow was then part of Austrian Galicia,) and a student of the notable Polish artist Józef Mehoffer. Bienenstock taught art at the the Przemysl Gymnasium. The interior, in the sole photo that I have seen, appears to reflect the influence of the Young Poland movement of which Mehoffer was part. Young Poland was the Polish version of the jugendstil (art nouveau) movement.